Sustainable tourism – which includes eco-tourism and community-based tourism – is the need of the hour in India. Sustainable tourism in India is being driven by social enterprises and offbeat travel companies, which not only offer sustainable holidays in India, but also meaningful travel experiences that can elevate your “Incredible India” experience. This post looks at responsible tourism in India, based on my travels over the past five years. There are many ways to experience India. You can stay in a generic hotel or backpacker hostel, hire a car for sightseeing, have casual interactions with people working in the hospitality industry, take some colourful photos and call it a trip. The real India though – the India that inspires and humbles, the India that is artistic yet genuine, the India that is simultaneously incredible and heartbreaking – takes a little effort to find. Inspiring and humbling – the lower Himalayas of Uttarakhand. Although I grew up in this country, it’s only in the last five years of travelling that I’ve discovered a more unique way to experience it. Away from the chaotic tourist towns and pages of the usual guidebooks, I’ve interacted intimately with an India that has put everything I know about life in perspective. And much of this India, I’ve found by travelling with – or seeking suggestions from – sustainable tourism companies across the country, run by inspiring individuals, in fair partnership with local communities and conscious of their impact on the local environment. Who knew that tiny obscure mountain villages in Uttarakhand, cradled by the snow-capped Garhwal Himalayas, are home to some of the world’s most expensive and wanted superfoods? Think amaranth, goji berries and foxtail millet, among others. And yet mountain dwellers are abandoning their farmlands for basic jobs in cities – unaware of the value of these superfoods. Out of this tragic situation was born Green People, an organisation that aims to encourage the reverse migration of farmers – by creating supply chains for the superfoods they can grow, and more importantly, by instilling pride in them for their unique culture and way of life. To facilitate the latter, Green People has set up “Goat Villages” – rustic ecolodges – near Nag Tibba, Kanatal and Uttarkashi in the Uttarakhand Himalayas. They’ve hired locals, trained them in hospitality at luxury resorts and entrusted them with independently hosting travellers from around the world, in aesthetically built Garhwali-style houses. 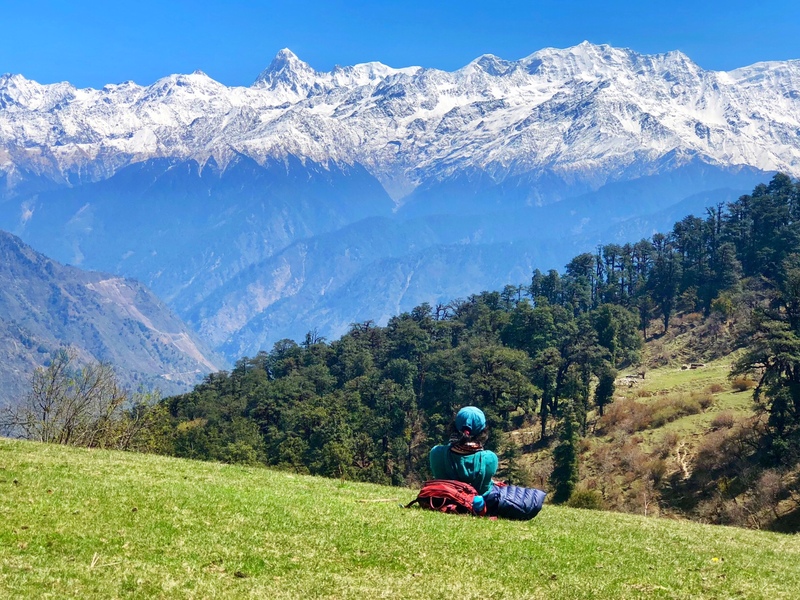 I’ve spent a week each at the Goat Villages near Nag Tibba and Uttarkashi – blissfully away from civilisation, electricity and technology – for some of my most rejuvenating and inspiring escapes amid the wild beauty of these mountains. The locations are spectacular, the local interactions heartwarming and the food – amaranth porridge, mandava-tofu sandwiches, Hersil rajma, barnyard millet to name a few – will make you rethink your organic and local choices. The superfoods grown in the Garhwal Himalayas are being sold by Green People under the brand name “Bakri Chaap” in supermarkets in big cities across India. Isn’t it ironic that while we’ve taken to consuming quinoa and couscous – which travel from halfway across the world – we’re mostly unaware of the delicious, nutritional food that grows in our own backyard? Blown away by the eco-luxury at Evolve Back, Kabini. I learnt early on in my travels that it is possible for an accommodation to be incredibly luxurious and environmentally responsible at the same time. But I didn’t realise to what extent, until I spent time at Evolve Back – a chain of eco-luxury resorts across Karnataka. Evolve Back Coorg (previously called Orange County) was perhaps the first of its kind in India – a sprawling 300-acre coffee plantation, interspersed with grand silver oak trees and plantation-style bungalows – built in local red brick and thatched or tiled roofs – to pamper travellers yet immerse them in the wild ways of nature. Each bungalow is fitted with RO water filters, eliminating the need for plastic bottled water; in other ways too, the plantation (and other Evolve Back properties) are pretty much plastic-free zones. Rainwater is harvested and its consumption in each cottage digitally monitored; wind electricity is generated at another site and fed into the state’s electricity grid; all waste is either composted or recycled; education in local schools is supported and monitored. And it is perhaps India’s only hotel chain to have an entire team dedicated to responsible travel. Yet, these sustainability initiatives are not the only reason to indulge in an Evolve Back experience. In Kabini, I was enchanted by majestic sunsets and high tea under an old fig tree; river and forest safaris with passionate naturalists who made me fall in love with India’s fascinating forests; a meal selection dedicated to sumptuous organic and locally grown food; and night skies that shimmered endlessly with stars. The locals of Munsiyari attend a yoga workshop during the Himal Kalasutra festival. When I finally decided to travel to the remote Himalayan region of Munsiyari, eleven hours by road from the nearest train station and flanked by the spectacular snow-capped Panchachuli range, I had no idea how much it was going to change my perceptions of Indian women and the patriarchal culture that plagues our society. Across the small mountain villages of Munsiyari tehsil, the social enterprise Himalayan Ark has aided local women to set up homestays, some in old and charming Kumaoni houses, others in aspirational homes with large glass windows overlooking the mountains. The warmth of the experience remains the same across the homestays though. Although most women in rural India seldom have land ownership rights or independent incomes to run their households, Himalayan Ark’s approach has enabled the women of Munsiyari to directly earn revenues from their homestays, and to step out of the kitchen to train as trekking and birdwatching guides. Himalayan Ark also offers mountain treks and expeditions, employing local guides, sourcing local produce and offering eco-conscious insights into this relatively undiscovered region. In May every year, the unique Himal Kalasutra festival brings out a different side of this region – featuring high altitude marathons, yoga workshops, photography workshops, birdwatching, celebration of the indigenous cuisine and a traditional carnival. Unlike most fusion mountain festivals, it is organised by locals and attended by locals, but discerning travellers are welcome to join! Celebrating Mopin with the Galo tribe of Arunachal Pradesh. The northeastern states of India are full of fascinating, unexplored, uncharted territory, and while tourism is still in its nascent stage, it is incumbent upon us travellers to ensure that it isn’t spoiled the same way as India’s scenic but garbage-filled hill stations. Consider Kipepeo, an organisation that partners with local homestays to offer trips (and custom tours) in the most natural way possible. On my first trip with them, our group wandered off the usual Arunachal Pradesh map and landed up in a village of the Galo tribe to celebrate their indigenous Mopin festival. Amid Shamanic chanting, hypnotic local dances and being offered rats for dinner at a village gathering (gulp), I felt like I had skipped a few decades and gone back to the India of yore – a most intriguing world! A new friend in a tribal village in Odisha’s Koraput region. The fascinating tribal world of Odisha is threatened by many challenges: interference by local authorities, pressure on the youth to ‘modernise’, decreasing forest cover, and most of all, insensitive tourists wanting to photograph local tribes without learning a thing about their culture or way of life. I was happy to resolve my internal conflict – between discovering a fascinating culture and irresponsible travel – when I stumbled upon Desia Ecotourism, a company founded by a local of eastern Odisha with a keen interest in the tribal culture of the southern Koraput region. Our modes of exploration included cycling through mango orchards to nearby tribal villages and riding pillion on motorbikes to further ones; our interactions with local tribes at their weekly haats (tribal markets) felt genuine and unobtrusive; and living at Desia Ecolodge, run largely by a mix of local tribes, made me feel at home in such a different part of the world. As a New York Times story recently expounded, sustainable travel is as much about environmental impact as it is about being inclusive and respectful of local communities. I remember wandering about the quiet streets of Purushwadi, a village in rural Maharashtra, on a dark moonless night, watching millions of fireflies communicate with potential partners through light beams, magically lighting up the earth in perfect symphony with thousands of stars in the skies above. There was a time when locals, unaware of this beautiful phenomenon, didn’t hesitate to kill (or at best, ignore) fireflies that came to their village to mate every monsoon. But using a unique business model where the local community is an equal partner in tourism, Grassroute Journeys has co-created the “Million Fireflies Festival” and other humbling travel experiences across rural Maharashtra. Besides playing an active role in protecting their luminescent visitors, the locals are now able to supplement their erratic agricultural incomes by hosting travellers in their homes (or in tents), and keep their traditional way of farming and life alive. And travellers like you and me, wandering in search of unique customs, exotic natural phenomena and joyful countryside living, can rejoice in both, finding such experiences not far from chaotic Mumbai and supporting rural village communities in the process. The awe-inspiring cold mountain desert of Spiti. Volunteer-travelling for a month with Spiti Ecosphere in the high altitude Spiti Valley, back in 2011, was my earliest introduction to responsible travel. It was the first time I learnt about community-run homestays and how tourism can supplement meagre farming incomes, how the money we spend on travel could be used to light up someone’s home with solar energy, and how different our travel experiences can be when we stay with locals and interact closely with their culture, food and way of life. Spiti Ecosphere believes in an equal emphasis on the planet, people and profits – and after all these years, I’ve realised that this is the only way for a tourism organisation to be truly sustainable. As for my experience – volunteering with them, exploring those stark barren mountains, lying under millions of stars at night, spending time with monks and nuns, it changed everything I thought I wanted from my own life. It made me quit my job at the Singapore Tourism Board, and gradually paved the way to this blog where I try to write about the joy of travelling meaningfully. A solo Nangiar Koothu performance in central Kerala. I thought I had already explored pretty ‘offbeat’ parts of Kerala independently – until I went on a journey with The Blue Yonder, a social enterprise started by a Kerala local, to learn about how the River Nila has inspired life along its shores. We met local musicians and artisans – some of who are the last in a lost generation of artists keeping a dying tradition or craft alive; we ended up watching a soul-stirring, solo Nangiar Koothu performance alongside village locals; and even felt entranced by an Oracle, supposedly possessed by the local deity. During my travels with The Blue Yonder, I began to perceive our impact on local communities differently. Many organisations only compensate the locals we meet along the way for the services they offer – mainly homestays and guides. But TBY professes a different philosophy – valuing (and hence compensating) the time that local artisans spend interacting with us as travellers, answering our many questions and being photographed by us. And if we really think about it, that is exactly how us urban creative people (aka freelancers) want to be treated too. “High tea” in the lower Himalayas of Uttarakhand. I co-founded India Untravelled back in 2012, hoping to bridge the digital marketing gap between small-scale sustainable homestays and discerning travellers looking for authentic experiences within India. The two-year long journey taught me a lot about running a business (we sold in 2014), but also helped me appreciate a different way of exploring India – one that I have never stopped swearing by. The current owners of India Untravelled have strived to keep our original dream alive – and now offer curated homestay experiences across India, including Uttarakhand, Ladakh, Kerala and other states. Roots Ladakh (Kargil): In the valleys and mountains around Kargil, where tourism infrastructure is still pretty underdeveloped, Roots Ladakh – set up by locals – promises respectful interaction and understanding of local communities. Health Nut (across India): As the vegan movement catches on in India, Health Nut, run by a health coach from my hometown Dehradun, offers eco-conscious retreats that focus on health, nutrition, reversing diseases and reconnecting with the great outdoors. Native Folks (Goa): We’re all familiar with the tourist-infested beaches of Goa, but Native Folks promises a different experience, living with locals on the laidback Divar Island. Rural Pleasure (Gujarat): While exploring Gujarat, I fell short of days to join Rural Pleasure to learn about the way of life of the fascinating Dang tribe. Kabani (Kerala): Amid the scenic rice paddies and backwaters of southern Kerala, Kabani – run by Kerala locals – works with local communities to offer homestays, travel programs run entirely by women for women and a chance to delve deeper into the offbeat side of this popular state. Ladakhi Women’s Travel Company(Ladakh): In the Indian Himalayas, where its still taboo for local women to train as mountain guides, the Ladakhi Women’s Travel Company – started and run entirely by local Ladakhi women – is challenging cultural stereotypes. I’ve heard great things about their trips in this spectacular region, which is being ruined by irresponsible tour operators. Life in the Garhwal Himalayas. And you, have you travelled with responsible travel companies within India – or elsewhere? I’d love to grow this list and my own understanding of sustainable tourism. Join me on Instagram, Twitter and Facebook for more responsible travel ideas. And I am traveling to the fireflies festival by Grass routes in a few days time! That sounds like an amazing story! Is there a specific organisation training them, or how can I get in touch? I’d love to explore it one of these days. And yay, the fireflies festival is awesome; hope you’ll love it too! Dear Shivya, as always I admire your travelling and your posts. I have travelled to India , my first time two years ago, as a single female traveler with my camera, as I am a professional photographer. Through my profession I just can’t do group travelling, since I love to wonder of into hidden alleys and little places where I often don’t see a tourist all day long. I had the most kindest driver for 11 days out of my almost 3 week trip mostly in Rajasthan. I had ruled out the places I wanted to see and at times the driver would even take to some interesting places to see, I was really blessed and felt very safe, since I explored all the places on my own. Yet I might miss out on some unique spots by just travelling alone??? So I guess this is a question to you. I lost my heart in your beautiful country. On another note, have you been in Myanmar yet? I haven’t been to Myanmar yet, but I sure want to one of these days. Are you heading there? I’ve felt a bit wary of travelling to India – too many stories that aren’t always good – but I’m going to share this post so I can find it, because I think travelling India this way will be perfect! Your posts are a delight, and always interesting. Thank you! Thanks Nadya! I know India doesn’t have the best reputation for travellers (especially solo female) – and sometimes for good reason. But as a solo woman traveller myself, I can personally vouch for these companies that truly take you off the beaten track – in a responsible and safe way. Just beautiful images and intentions. I love that companies are seeing the value in sustainable tourism options. Some amazing options here for travel to have positive impacts on the traveler and the local communities. Cheers from Copenhagen. Incidentally my next post is based on Copenhagen; love your city! And yes, it’s great to see more companies adopting sustainable tourism practices – makes a big differences in the way we experience places too. Have you known of Unventured? How did you miss it? Haven’t heard about it before; will google now. Thanks for the nice summary of sustainable tourism companies. Hope it’ll be helpful on your own travels, Anand. Very attractive & beautiful place to visit. Thanks for such nice information. Thanks Rebecca! I always say it’s the need of the hour – but also a more immersive and meaningful way to travel. Yay, mission accomplished! I’m so glad you’re thinking about sustainable travel and encouraging others too. I’m still on a journey to learn more, and these orgs have really helped. Hope you’ll feel the same way Mohana! Hi Shivya, For donkey years, I have been a regular reader of your blog. A solo woman traveler who is location independent. Sounds marvelous and inspiring. Aww thanks Indu; always good to hear from long term readers! wow shivya you inspired me a lot! Thanks for the valuable sharing. Keep rocking my dear. Glad to hear that Tanu! Astonishing, each time you share your travel knowledge and experience! 🙂 Hopefully it’ll inspire more people to reconsider their travel choices! Really inspiring. Thanks for sharing. Such an expansive post on travelling in India and exploring the limitless facets and humans often hidden. Thanks for bringing this rich culture out and yes I do follow India Untravelled. Love the stuff about travel alive and vibrant. Eco tourism in India is a must and glad you wrote about it. Hi Shivya, I discovered you through Kuntal Joiser’s instagram account, and I must admit I found a gem of a blog. I hate those blogs full of ads, that try to sell you something all the time, where girls travel dressed as if they were going to their sister’s marriage are posing in bikini’s with a load of make up and not a drop of sweat, or that post highly edited and unrealistic photos. I am more your travel type: I enjoy traveling slowly, in comfortable clothes, explore a lot on foot, like to mix with the locals and eat their food, roam the backstreets and love off-the-beaten-track destinations. And I absolutely love India: been 10 times, mostly for work, but almost every time I could travel a bit, and the best part is that I got invited to my colleagues houses and met their families, that was for me one of the best travel experiences ever. I am very interested in trekking in Ladakh and will definitely check out this Women’s travel company, thanks for recommending it! Congratulations on your blog and on your lifestyle! I did not have the opportunity to leave it all behind when I was younger but I really admire the courage of the people who do it. Another input for a sustainable company. A company that was sustainable, eco friendly before the words kind of became “main stream”. Check out http://www.cghearth.com. We need more posts like this!!! Cant wait to visit some of these places! Hi shivya- love your blog. I am planning a trip for my family and wondered if you have suggestions of places that would be good for families. Looking for somewhere where we can immerse in a locale as Well as do some service. Not looking in india (because we have family there and they will want us to stay with them 🙂 or asia. maybe south america, europe, northern africa…? Hi Shivya, thanks for the post – such an enlightening read! I’m planning on travelling through Amritsar and Rajasthan by myself, and I’d be keen to experience an offbeat side of both places if possible, and with a local travel company. Do you know of anyone that organises solo/ trips for 2 people in either of these locations? Previous PostHow I Managed to Pay Off 26000$ of Student Loan: Candid Tips for Freelancers and Travel Bloggers! Next PostFun and Alternative Things to do in Copenhagen – Perhaps Europe’s Coolest Capital City.